So Robert De Niro gets a copy of the script for his new movie. He reads it through a few times, memorizes his lines, and then gets in front of the camera and does his thing! This article takes a look at various acting techniques and discusses that possible situation. For those of us who have never taken acting lessons or been in the industry, we may think that all an actor does is read the script, practice his or her lines a bit, then get in front of the camera and just "act". Not so! It turns out there are a number of techniques and ideals to be called upon to help an actor or actress perform their part. Around the turn into the 20th century some actors and directors were looking at their acting and wondering how they could make it better, especially in the theatre realm. Do they continue to just hold the skull up and blandly spout lines of Shakespeare, relying on the words of the play to create the atmosphere and emotion? 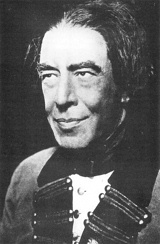 Russian actor and director, Constantin Stanislavski (pictured) was one such person, who intently wanted to create better actors and consequently better portrayals of their roles. Over many years of work he developed "the system" whereby an actor can control in their performance the abstract aspects of human behaviour as related to their role, such as the character's emotions and motivations. Many offshoots of Stanislavski's "system" were developed over the coming decades, which we will look at some shortly, but his was the first to turn into a major school of thought, and training. In his early days, he taught actors to intensely study their character's roles, including the psychological and emotional motivations, but then draw upon their own life experiences to inflect into that character. This drawing upon ones own life experiences is called sense memory. It is also part of what later became to be called Method. Ironically, in later years Stanislavski began to de-emphasize the importance of sense memory and evoking personal experience, and give greater emphasis to the physicality of role portrayal. For instance, he felt that all actions that a person must perform in their role, even most basic things as walking and sitting, must be deconstructed, evaluated as it relates to the role, and completely re-learned. Related to this, he also developed an approach he called Method of Physical Action. He believed that while emotional memory, or sense memory, is a worthwhile tool for research and rehearsal, the most important resource at the actor's hand is "the body". He felt that the only thing the actor could truly control is "his body", but that this can be only achieved through intense physical training and a complete understanding of what is needed to properly portray physical action. He believed that years of training are needed for an actor to be truly armed with the tools needed to handle a role. While Stanislavski's "system" changed and evolved over the years, he always endeavored to achieve his main ideals of creating truth and accuracy in performance. However, even from the beginning, there were detractors to his "system". Two students in Russia, Vsevolod Meyerhold and Mikhail Chekhov, did not agree with the emphasis on psychological stimulation and believed more in training based in the physical and imagination. Later on, in the 1930s, both French theorist Antonin Artaud and German playwright Bertoit Brecht felt that Stanislavski's training was inordinately naturalistic and inward-looking. Other students, either being directly taught by Stanislavski, or by others who studied under him, did believe in his teachings to one degree or another, particularly in America where, outside of Russia, he seemed to be championed the most. Some of these Stansilavski proponents included Lee Strasberg, Stella Adler and Sanford Meisner. The Group Theatre in New York City was the first to promote what became known as Method Acting in the 1930s. It was then taken up and taught by Lee Strasberg at the Actors Studio in the 1940s. This technique is quite similar to the earlier teachings of Stanislavski. With it the actors aim to recreate in themselves the emotions, beliefs and thoughts of their characters in an attempt to create the most lifelike performances possible. Method actors sometimes are seen as actors who so completely engage themselves in their character that they continue to portray them even off-set. Yet, while this does happen on occasion with some actors, it is not commonly taught as part of a Method Acting curriculum. Indeed, Stanislavski must have forseen the possible psychological or emotional problems, because he taught that even though an actor should deeply analyze and familiarize themselves with their character's thoughts, emotions and motivations, the actor should be extremely careful to not get too close. This was recently shown to be a distinct possibility with the tragic death of Heath Ledger. It is believed he was on such a lethal dose of prescription medicines due to having difficulties with removing himself from the role he was playing in the movie The Dark Knight. Stella Adler was an actress and teacher who had studied under both Stanislavski and Strasberg yet she broke away to teach an offshoot of Method Acting. Her adaptation taught the idea that actors should incite emotion for their portrayals, not by drawing on their own personal memories and experience, but by analyzing and using the scene's particular situation. Finally, Sanford Meisner created another technique that was dervied from Stanslavski's "system" yet still different. In Meisner's curriculum the students work through a series of increasingly complicated exercises which will develop their ability to improvise and include one's own personal and emotional life. Meisner also stressed the propogation of "in the moment" scenes by playing off the other actor(s). Meisner training also taught that during script reading and line memorization the actors should avoid adding vocal inflection and only learn the lines "dry". Therefore, when it came time to deliver the line before the camera, its caliber and articulation are a product of the given circumstance of the scene. So Meisner's goal is that between spontaneity and improvisation the actor can produce a behaviour that is "truthful" under imaginary situations. If we look back at the beginning of this article, with the Robert De Niro example, we made it seem like acting was a simple thing that does not require training or any anaylsis on the actor's part. As you see, there actually are quite a number of schools of thought and training streams many actors can take part in. Constantin Stanislavski's "system" and its later derivatives are the most popular types of acting techniques and training. So the next time you think or hear of the line; "Oh, he is just a method actor", you will remember now that it actually means something of importance.